Capture your loved ones at a family party, your friends at a birthday bash or your pets being adorable. The Xperia XA2's 23MP rear camera has an ISO 12800 image sensor, so you'll get a great shot every time, even in low light. Had a fun day? Snap a selfie to remember it by. With its 8MP, super wide-angle selfie camera, the Xperia XA2's sure to fit everyone in. Whether you're into nature documentaries, gritty dramas or both, feel like you're part of the action when you're watching your favourite shows. 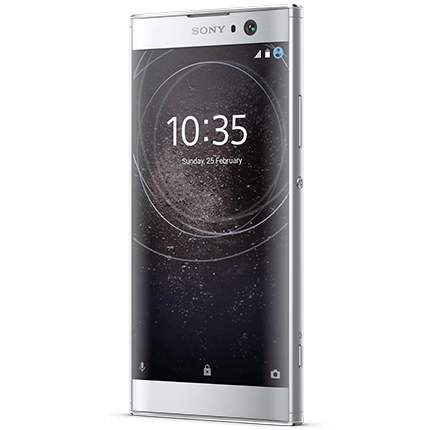 The Xperia XA2 has a 5.2-inch full HD screen, so you can really lose yourself in the story. And thanks to the borderless design, all that screen comes as part of a compact phone. So you'll never need, or want, to leave home without it. Don't stress about running out of battery on the last train home. The Sony Xperia XA2 helps you take control. It gets to know you and how you use your phone, and manages your power consumption to make your battery last longer. It tells you how long your battery's likely to last, based on how you normally use your phone. And it gives you a heads up if it thinks you're going to struggle for battery later on. So you can plan ahead and make sure you'll have enough juice to call for a lift at the end of the day. No signal? No problem, with Wifi Calling. Whether you're at home, in a coffee shop or at the office, if you're having a signal problem, you can use wifi to call as normal. And 4G Calling lets you make even clearer calls, over 4G. With Wifi and 4G Calling you'll move seamlessly between wifi and 4G network coverage to continue your call, while being able to check your mail or browse the internet at the same time.